I want to tell you about my love for idols today if you don’t know who/what they are! How to explain idols? The essence of Japanese girl idols – a very ordinary girl with perhaps no extraordinary talents takes on being a singer and entertainer! Somehow, it’s just so heartwarming seeing idols grow up to be able to watch ordinary girls like you and me become someone successful! They generally start very young perhaps even as young as 11. They’re selected through audition and if they’re lucky enough to make it, they’re shoved into a girl group with little to no training. But please note – the audition process isn’t about picking the best candidate, but a diamond in the rough! They’re challenged to sing and dance at such a young age and keep up with the other girls that were added before them. My favorite idol group is Morning Musume. I myself secretly wished I could join too! 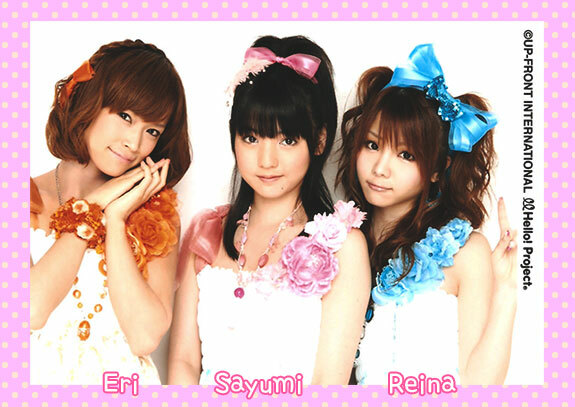 The girls I followed were part of 6th generation of Morning Musume – Eri, Sayumi, and Reina. And they’ve all become very successful in their own ways. It’s been a source of inspiration for me growing up. I was crazy enough to submit an application to audition for Morning Musume too! I obviously didn’t pass the audition otherwise I wouldn’t be writing on this blog, haha. But they also served as an inspiration for me in many other ways. Seeing them never give up on the difficulties of being an idol made me also feel the same I also shouldn’t give up at anything I was doing! Is that crazy? Haha, it’s OK if you think so! Morning Musume also got me into Japanese fashion. When I was young, I was super obsessed about collecting Japanese magazines! I was so proud that I had a huge book shelf full of them. And well, the rest is history considering you know I opened this blog! Anyways! If you’re bored enough, you can watch 2 videos – 1) When 6th Generation debuted in 2003 and 2) When 6th Generation last performed together in 2011. There is a huge difference not just in talent, but also in confidence! And from the original video, you might think these girls would NEVER get this far. But they never gave up! One of the girls, Sayumi, her forte never was singing and it still isn’t. But she’s become successful as an entertainer. She appears on TV shows all the time. So it’s not all just about singing! Eri, on the other hand, her singing wasn’t the best at first. But she has improved SO MUCH. I simply love their tone of her voice. It’s so soothing, but so cute too. She may not be the best technically, but I don’t care to listen to someone belt it out when I don’t care about the tone of the voice! Another thing is.. Eri decided to become an idol because she was tired of being shy. She was tired of being someone that couldn’t speak confidently! And look at her today, she is so confident in front the crowd in a large concert hall. I actually feel teary eyed when I see all of this. Yes, this is the kind of stuff that makes me happy and motivated. Also, when the Before video first came out, I religiously watched it hoping I could be like them too. I wonder if I have become successful in my own right? Am I like the After too? What do you guys think of idols? What inspires you and makes you motivated? And for those of you that like idols already, is this the same reason you like them too? P.S. And of course, the music is also another reason why I love them! OMG you auditioned for my beloved Morning Musume?! Did you live in Japan at that time? Haha.. Audition?! I said I submitted APPLICATION. They didn’t select me to go to Japan. I wish, hahaha. And your personality would make a very good idol! ^o^ So many idols are all looks, but their personality is boring. You are so funny and interesting! Eri is my all time favorite, but with the current girls, Sayu is also my favorite! I also wish to be cute like her!